Koalas are also called koala bears, even though koalas and bears are very different. Inhabiting Eastern Australia, Koalas are one of the most well-known animals on the continent. Koalas have short fur, no tails, and typically grow to 33.5 inches. These furry critters eat at night and sleep during the day. Their diet includes leaves of the gum tree, or eucalyptus, and they get all of their water from their food. 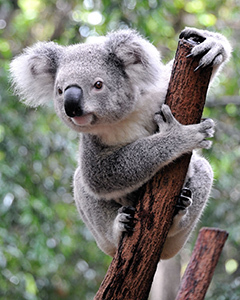 To get food from these trees, koalas have sharp claws that they use to climb smooth bark. Like all marsupials, including kangaroos, koalas have pouches in which they carry their babies. Female koalas deliver one baby at a time and the baby spends at least six months in her mother’s pouch before climbing onto her mother's back. Koalas carry their babies in a small pouch near their rear so when they are standing straight the opening is facing the ground. It may sound dangerous, but baby koalas cannot fall out. These adorable animals are just one reason to visit Australia. If you’re ever in this country, see if you can spot one!